Leeds writer Anthony Clavane’s first book, Promised Land, interwove the history of his native city, and his love of its football team, with an autobiographical account of the author’s own upbringing in Leeds’ Jewish community. His next, Does Your Rabbi Know You’re Here?, looked at Jewish involvement in professional football, and his recent play, Playing the Joker, is a re-imagining of the career of Eddie Waring, rugby league commentator and archetypal ‘northerner’ to the country at large. 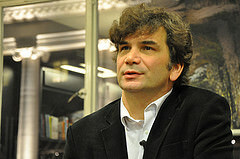 These interconnected literary works reflect Anthony’s inspirations and interests; a journalist by profession, he has also been a major supporter of the Big Bookend. I posed a few questions on these themes, and topical issues, for him to expand upon. 1. How would you say that Leeds, Yorkshire, and Leeds United, are perceived outside the county – do some of the old stereotypes still persist? The perception of all three is changing, I think. But, on the whole, Leeds is still seen – like Yorkshire – as the “Other”. I was at a very interesting debate at the Town Hall about whether Leeds should bid for European City of Culture. For me it’s a no-brainer, but it’s interesting that the question had to be asked. In Manchester and Liverpool they would just do it. As for Leeds United, well don’t get me started. How on earth a team with their history from a city this size could be out of the Premier League for a decade beggars belief. It is, as I wrote in Promised Land, symbolic of an exclusion from the centre of power – in the economy, culture, politics and so on. There has been a re-energising process recently – the Arena, Trinity, Leeds going for European City of Culture – which, hopefully, will be reflected in the achievements of the team – as was the case in the 1960s and 1990s. But I write after going to the last two Leeds games – which we won – when the manager was sacked then reinstated, an Italian businessman convicted of fraud looked set to take over, a winding-up order had been served…all part of this bizarre, doom-laden Leeds United narrative. The most interesting thing, for me, is that the old stereotype of Leeds fans is changing. They have shown, like Hull fans opposed to their owner’s plan to change the club’s name, that old-fashioned things like loyalty passion and dignity still matter to some people. Despite losing 6-0 to Sheffield Wednesday and going out of the Cup against a lower league team, the fans rallied behind the manager Brian McDermott – and, in effect, got him reinstated. And the old, southern view of Leeds “yobs” is being transformed: a new respect is emerging, which is another reason to be cheerful. As for Yorkshire, well I grew up in an era when it was still possible to subscribe to the adage: “When Yorkshire are strong, England are strong.” I can remember one year in particular – 1968 – when it seemed that all my teams were flying high. Leeds United won two major trophies, Leeds Rugby League triumphed in the famous Watersplash Final and Yorkshire were crowned county champions for the third successive season. God’s Own County. But I feel Yorkshire’s industrial decline has been mirrored by its sporting decline. Headingley no longer hosts Ashes tests, apart from Hull City there are no Yorkshire teams in the Premier League and rugby league – a Yorkshire/Lancashire sport – is still not recognised nationally for the brilliant game it is. 2. Do you take a journalistic approach into writing your books – they clearly involve a great deal of investigative research? I love the research. And there’s no doubt being a journalist for 20-odd years has helped that part. But I like to think that both my books were an imaginative, if non-fictional, investigation of two parts of my identity – my Leedsness and my Jewishness. They are both part-autobiographical, part talking to lots of interesting people with fascinating stories – but they are also social and cultural histories of English life over the past 200 years. 3. What drew you to Eddie Waring as a subject? To those of a certain age he is a legend. And people were – and are – very divided about his legacy. At one point he was the most impersonated man in England, but it wasn’t clear whether he was being laughed at or laughed with. He was a jolly BBC rugby league commentator in the 60s and 70s, renowned for catch phrases like “up and under” and “early bath”. But behind the façade he was a sharp operator, using his jocular image as a bit of a front. And it interests me how a man who virtually ran the game from his unofficial headquarters at the Queen’s Hotel, and made many deals there, could have a public image that was so at odds with his “real” personality. The other, and even bigger, fascination for me was that, despite being a national treasure, he was despised by some Yorkshiremen who believed he had sold out to the devil, making a mockery of rugby league and the North. And I wanted to examine this “northern fundamentalism” – which is both very moving and slightly absurd – in the character of the young rugby league fan who confronts him at the Queen’s Hotel. 4. What do you regard as being the main changes in English football – both positive and negative – since the advent of the Premiership? Since the Hillsborough disaster, football has changed beyond recognition. It was the sport’s biggest disaster and, of course, it came at the end of a decade, the 1980s, when football was infected by hooliganism, racism and bad haircuts. So the 1990s – Gazza’s tears, Italia 90, the Premier League, all-seater stadia, Nick Hornby – were a rebirth, possibly a reinvention, of the people’s game. The problem is the baby was thrown out with the bathwater. Those three things I associated with Leeds fans in recent weeks – loyalty, passion and dignity – have been eroded as football has become a global game so rapacious that true fans – at Leeds, Hull, Cardiff – have been disenfranchised by Bond-Villain-type owners. The most frightening statistic is this: the average age of a season ticket holder in England is 41, compared to 21 in Germany. Young football fans are simply being priced out of going to see their local clubs – and end up watching global brands like Man City, Chelsea, Barcelona, etc on TV. Football used to be a community-based sport – now it is more of an individualistic one. 5. As the birthplace of writers such as Alan Bennett and Keith Waterhouse, amongst many others, do you think that Leeds has sold itself short, culturally, in comparison with other northern cities such as Liverpool and Manchester? I think there is a new energy around at the moment but since these writers’ heyday, we have not shouted from the rooftops like Liverpool and Manchester have done. The reason for this is something I tried to explore in Promised Land. 6. What projects do you have in mind for the future? A book about the north-south divide, which has grown bigger and bigger since the Thatcherite 1980s. It’s an imbalance that is not only reflected in politics, the economy and the media, but also in football, cricket and rugby league; the chasm between the two codes of rugby, for example, is still one of the great north-south divides. The Premier League now tilts towards the south, with only the odd, peculiar, brief White Rose aberration – Barnsley ten years ago, Hull today – disturbing the trend. Each year I spend a fortnight teaching kids from the toughest area of Barnsley – who go to the school where Kes was filmed – and it is striking just how many of them wear Manchester United, Arsenal and Chelsea tops. My new book will look at Yorkshire’s sporting life through their eyes, and through those of its footballers, cricketers and rugby league players, and through former miners and steelworkers, and will explore the way books, plays, music and films, from Kes to The Full Monty, have portrayed the hopes and ideals of an identity now, it would seem, consigned to the margins of power. Playing the Joker will be on tour with Red Ladder Theatre Company in Yorkshire very soon with some very special performances. Find out more by keeping in contact with Red Ladder. You can watch a clip of Playing the Joker here.